Did you know that only 50% of organisations have any evidence that everyone has read and accepted their IT Acceptable Usage Policy (AUP)? How well protected are you from a breach of the Data Protection Act? Are you at risk of having confidential competitive data disclosed during a tender process through the FOI Act? Can you legitimately access an employee’s email in their absence under the RIPA Act or will you breach the Human Rights Act? 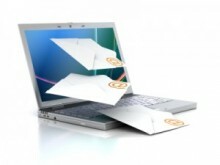 The laws relating to email are complex. We help organisations mitigate the risks of non-compliance and security breaches by ensuring that users comply with current legislation and the business continuity policy. It is not enough just to have an acceptable usage policy. It needs to be robust and organisations need to ensure that users adhere to it; otherwise they are potentially signing money away. Reduce the risk of penalties from non-compliance and email misuse. Limit the risks of leaking confidential data through email. Develop and implement an acceptable email usage policy. Co-ordinate the IT policies to create a coherent business email strategy in-line with corporate responsibilities. Align the email usage policy to other key business strategies such as knowledge management, electronic records management, green economy. To check how robust is your email acceptable usage policy use our AUP benchmarking tool click here.